A functioning sump pump is generally synonymous to any of today’s insurance policies. As a matter of fact, sump pumps are gradually becoming a must-have for many homes around the world. Unlike some other household appliances bought out of convenience, sump pumps have saved a lot of homes from damages due to flooding. The basements of many homes are easily susceptible to flooding due to improper channelling of drainage water or high ground water level. Whatever it is, installing these sump pumps in the house can allow you sleep through a deadly storm. While there are many articles out there that can give detailed DIYs on the installation process of the sump pumps, there is one other component in the setup that we often fail to give necessary attention. This is none other but the battery backup for the pumps. They are basically installed to act as excellent supplement for the primary pumps. Getting the best battery backup sump pump is important for ensuring the, aim purpose of the sump pump is not defeated. These backup batteries come in handy when there are mechanical failures or power outages. To ensure these factors do not create unnecessary flooding in your basement, you should consider installing one of these. In no way should these battery backup sump pumps be mistaken as an excuse to lazy with routine primary pump maintenance. It is worthy to note that the essence of the battery backup is to act in place of the primary pump while the latter gets repaired or replaced. There are many manufacturers of these battery backup sump pumps. It is important to connect these battery backup to the exact output capacity of the primary pumps. 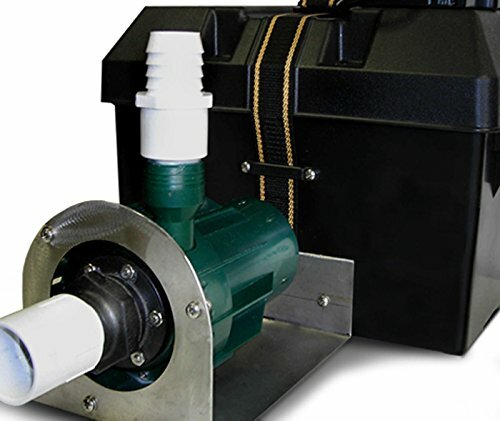 Here are quick examples of battery backup sump pumps that are available in the market today. This is a high flow pump system with a 12 volt reliable battery. It is designed with a smart charging technology and also an audible that triggers to inform you that the battery backup is powered on. It is capable of pumping about 2300 gallons of water per hour and can also have a lift of 10 feet. With its thermoplastic construction, it is highly anti-corrosive. The system requires just a single battery of either 40 ampere hour or a 75 ampere hour. 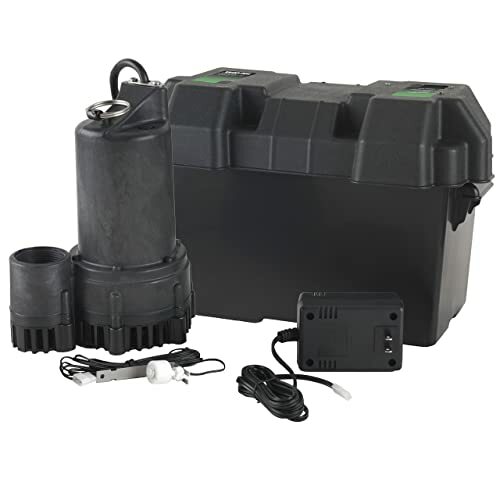 For a battery backup sump pump at this price, this product has a very good performance. It has a well designed and heavy duty pump. This is an ideal pump for areas with little to moderate flooding problems. 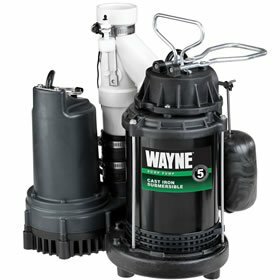 This Wayne battery backup pump is one of the easiest pumps to install. Instructions are easy to follow and the battery backup sump pump should be installed in a couple of minutes without any hassle. At an average price like this, this battery backup sump pump is not really professional like others in its grade. The construction material used is composed mainly of plastic; this includes the impeller. This means that pump can only be used effectively to pump water. Pebbles or other solids can destroy the impeller. There is no monitor to check the water/acid level of the battery backup pump. This is a guaranteed battery backup system that provides backup power to primary pumps. Each and every model has a battery burn out and overcharge. This particular model comes with its own 10 ampere battery. The battery backup has automatic alarms to notify home owners when it begins to work. It also has warning systems and indicator lights. If you are looking for a battery backup sump pump you can trust, the Zoeller 507 is your best bet. The battery backup works perfectly as the main pump. It has an incredible alarm that goes off when the main sump pump is not working. The battery backup sump pump picks up the draining exercise almost immediately, ensuring you don't have to worry about having a flooded basement. The check system on the battery backup seem to get loose and allow for water sip. Take care to inspect this check system during installation and operation. It won't fit into a shallow sump pit because it needs vertical room for proper installation. The system comes with a high output submersible pump of 12 volts. Its control panel has a mercury-free switch. It is triggered automatically once the primary pump goes out. It does not come with the battery but comes with the strap and box for the battery. It comes with some pipes like the tees, and bushings and check valves for 1-1/2” or 1-1/4”. It is designed for use with a primary pump that has 120V. The product comes with a well written and easy to understand installation guide. It can easily be setup in less than an hour, if you follow the instructions judiciously. This battery backup sump pump has well above average performance rating to guard any basement against flooding. It's performance and draining abilities makes it ideal for areas susceptible to flooding. The battery backup is nearly as fast in draining as the main pump. It gives an untold peace of mind, even during heavy flooding. There are some limitations with the PVC fittings provided. One would need to purchase an extra back flow preventer. The product is designed to have its battery backup sit on the main pump. This doesn't allow for much flexibility. The product seem a little overpriced in comparison to others with its features. It pumps out 2500 GPH when at 0 feet but at 10 feet, it can conveniently pump out 1730 GPH. It has an easy control panel that tells users how to perform easy maintenance. It also has indicator lights and warning systems. Battery fluid levels are monitored by sensors. It can easily be installed in a small pit with the primary pump. It comes with a 2 year manufacturer’s warranty. This battery backup sump pump comes with an alarm that goes off when distilled water level in the battery is low. It comes with a computer controller panel that allows for monitoring of the alarms. The product comes with clear, well-specified instructions that are very easy to follow. It comes with a very loud alarm system that echoes around the house. The product does not seem to be compatible with some battery brands. The manufacturer can only guarantee compatibility with thier battery which is usually more expensive that other batteries. The battery only has about 2-3 years service life and usually gets burnt by product's controller. The product requires a whole lot of maintenance to achieve good performance over a long period of time. This battery backup sump pump system needs to be placed in a dry part of the basement. Preferably you can raise it high on a platform. It is common in most homes because it can fit into small sump pits. It comes with a very easy to install owner’s manual and should not take more than an hour to install. It is designed with stainless steel hardware. It comes with a complete installation kit excluding the battery. It makes use of a 12 volt Marine Deep Cycle Battery of size 27. It comes with a manufacturer’s warranty of 4 years. This battery backup sump pump can keep your basement floor dry because of its great performance. If you are a DIY person, you will find the installation guide very useful and easy to follow. Within minutes, if you follow the instructions properly, the battery backup sump pump is ready for use. It performs well in areas of high flooding and would readily drain the pit. The battery backup pump also has similar draining capabilities and a great backup for the main pump in case it develops faults. The alarm is not as audible as it should be. Unless the house is quiet, one may not be able to hear when the alarm goes off. There's a small opening in the pipe. Unless this is fixed, it tends to generally slow down the discharge rate. The price is a bit on the high side if you are on a budget. The primary pump can discharge about 4200 GPH at 0 feet. It works with a 120 Volt primary pump with 1/2 HP pumps. 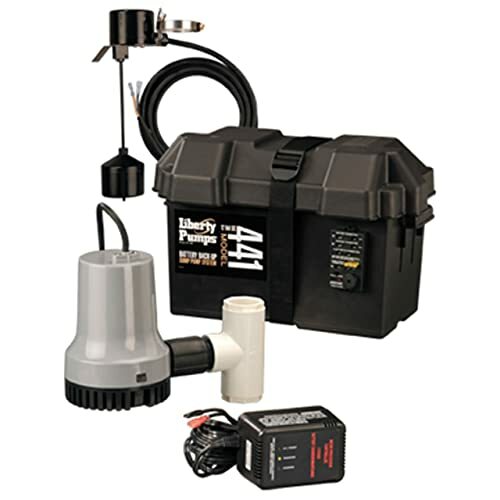 This 12 Volt battery backup sump pump is capable of pumping 3300 GPH at 0 feet. The battery backup pump comes with an alarm system and indicator lights. This is useful in alerting the home owner when the battery backup starts working. The product can work on sump basins that have 15” diameter. It comes with a manufacturer’s warranty of up to 5 years. 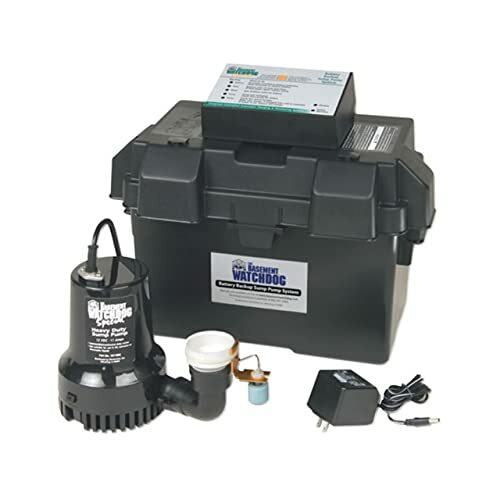 This battery backup sump pump comes with an easy to install guide which makes installation very simplified and easy. It comes with two built in check valves and works extremely quiet; you would have to be very close to it to hear it. The battery backup is so efficient, it performs efficiently when the main pump goes off or is faulty. Just like a good battery backup sump pump is supposed to function, it sets off a loud alarm to indicate that the battery backup is working. This signals that the main sump pump has stopped working. The switch is a bit prone to damage. Extra care must be given to it. You would need to purchase the battery backup separately and this would cost you an extra cash. The basic idea of having a sump pump installed in your home is to eliminate the possibility of your home basement flooding. Undoubtedly, this can be achieved by getting a quality, functioning sump pump. Now let us imagine you have got the best sump pump installed in your home and a heavy storm comes raging. You sit upstairs in your home knowing full well that your pump has got it all covered. Just when you are able to take a good, nice sleep, there was a sudden power outage. This is an expected occurrence but how prepared were you for such? Depending on how quickly your thoughts can process it, you will soon realize your sump pump is electrically powered. The power outage has not only put you in darkness, it now poses a more disastrous possibility – flooding in your home. Basically there are two types of battery backup sump pumps – AC and AC/DC. With either of these pre-installed along with your sump pump, you would rest easy even when power outage occurs. Well you may be thinking aloud and saying the possibility of a power outage occurring is down to a minimum. This also doesn’t rule out the fact that the sump pump can at any time develop mechanical failure, probably as a result of excessive usage and poor maintenance procedures. While the most common issues that could result to failure of the primary pump is as a result of mechanical problems. In homes where there is not frequent flooding, the primary pump may not function too well and would need routine maintenance and servicing. It would be folly to think because the pumps are not used often, that they would remain in good working condition year in, year out. Before buying that battery backup sump pump, you may want to take a closer look at some of these things to consider. Anything worth doing, they say, is worth doing well. For this reason, we have highlighted the best ways to go about buying that battery backup sump pump. Yes! This also has a major role to play as it is important for the general service life of the pump. It is recommended that cast iron constructed pumps are more rugged and long lasting than plastic counterpart. Just choosing a cast iron pump over a plastic one is not all there is to buying a sump pump. More importantly, you would have to consider its working capacity. Many people make the mistake of buying a battery backup sump pump with a working capacity far less than the primary pump. For this kind of people, what exactly was the purpose for installing a “backup” in the first place if it cannot guarantee perfect replacement in time of need? So we don’t waste words on this, please get the exact or more (never less) output on your battery backup sump pump as you have in your primary pump. As we earlier stated, there are two main types of backup pumps. These are the DC and AC/DC pumps. The DC pumps can only work with the electrical current and can only last as long as the battery allows. The AC/DC pumps on the other hand can work with or without your wall current. For this reason, it is recommended to always go with the AC/DC pumps. Obviously, the AC/DC pumps are more expensive than the DC pumps but sometimes, there’s more to it all that saving up cash. It is good to quickly add this to the list of how to choose quality battery backup pumps. One of the advantages of buying from a reputable store is that you are guaranteed of their assistance whenever you run into problems. These reputable stores sometimes do offer additional warranty on the product. 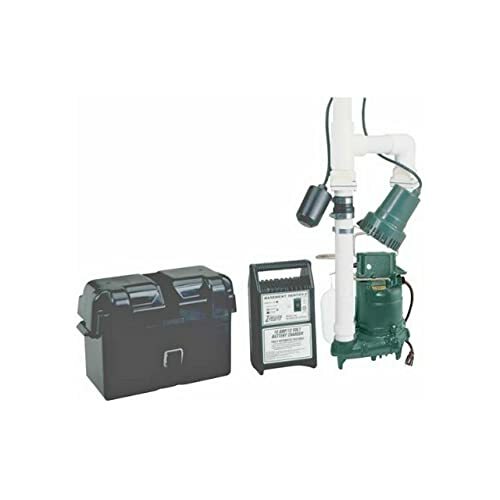 This allows you to do routine maintenance and ensure the service life of the battery backup sump pump system is optimized. Buying a battery backup sump pump is definitely the first step but knowing how to use it is even more important. Understand that as a backup to your primary pump, the battery backup pump should also be reliable to perform if anything should happen to the primary pump. So briefly we are still going to highlight some tips on how to use it properly. The first and foremost thing to know is how the battery backup is powered. Would it be triggered automatically or manually? If the pump is an old system, chances are that it would require manual activation. Either way, consult the owner’s manual to know more about this. This should go without saying but you have to ensure you do not put yourself or your home in any form of electrical danger. If the main power control is located in your basement, you should take extra care not to walk on wet basement floor. Preferably, it is advisable to call your local electrician to help rewire. The pump should be placed in a place that it would not be exposed to the elements of weather. Advisably, do not use an extension cord to connect the pump. This is because it may not fit firmly and can cut electrical supply to the pump. If there is need for an extension cord, please ensure it is of the same configuration to avoid interrupted current supply. As much as possible, avoid handling of the pump’s control unit or cord when your hands are wet. Like I said earlier, this should have gone without saying but sometimes we get carried away. For recent modern batteries, once turned on, you can be rest assured that it would regulate itself automatically. Some have a built-in alarm that would notify you when it is powered. This alarm works in a similar manner as a smoke detector. To ensure optimal use of the battery backup, we have decided to list out some likeable problems that may arise and their solutions. We will also list out some general questions that you may want to know. Why do I need a battery backup sump pump? If there is power outage, this would stop the sump pump from working. With a battery backup, you can be rest assured that your basement would not be flooded. The battery backup should be able to work until the primary pump is restored back to working capacity. What could cause sump pump failure? There are quite a number of things that could lead to this. It could just be a general power failure or a blown fuse from the sump motor. Other causes could be a problem with the impeller or blockage and clogging of the discharge pipe. If these are not the cause, it could just be that the pump is old and would need replacement. I own a generator; would I still need to install a battery backup sump pump? Yes you would. Understandably one would think that is what generators are designed to do but installing a battery backup would ensure a continuous and guaranteed protection of your basement. How easy is it to install a battery backup sump pump? The truth is that installation is as simple as ABCs and can easily be done with a step-by-step DIY guide. Every system comes with its own installation guide so you would be able to walk your way through the installation process. The acid in my battery is exhausted; what should I do? You would need to buy more acid from a battery store. If you are certain you know what you are doing, you can easily do this yourself. If not, please contact the services of a professional to come have a look at it. Actually you can do that to increase the pumping time of the battery backup. However you would need to use batteries of same age and size. If you need this done but don’t know much about batteries, please contact the services of a professional. How can I dispose of extra battery acid? You can simply do this by adding baking soda to it. This would neutralize the effect of the acid. You can also dispose of it at any location that has HazMat pick up. Do I need extra items to connect the batter backup sump pump? You would need to purchase battery acid, PVC primer, and some plumbing materials that would be stated on the owner’s manual. No doubt we all can agree to the importance of a battery backup sump pump to a primary pump. There are many unforeseen occurrences that could take out the primary pumps; it is always safe to know you can easily rely on a backup system. When choosing to buy the best battery backup sump pump, there are several factors you may want to take into consideration. These factors would ensure that you do not waste your money in getting a below par product. It is important that your battery backup sump pump have the same output capacity as the primary pump. This would give you a great assurance that the battery backup pump has got your back! Did you find your sump pump? Best sump pump will give you a list of sump pumps for you. Each product will be describe very specific and easy to understand.